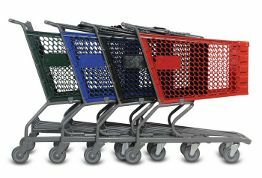 We carry a variety of sizes of new metal shopping carts. We also have a variety of new plastic shopping carts. Carriage Trade carries a variety of both new and refurbished shopping carts as well as metal and plastic shopping carts. Our metal carts feature E-coated tubes and wire for added longevity and sturdiness. Our powder coating provides a strong seal that also protects the carts from rusting and keeps the weld point from premature aging. Wwe also carry a unique line of E-carts that are the most modern on the market. These E-carts are characterized by flat tubular frames which provide tremendous strength and rigidness for added capacity. Another feature of the E-carts is the modern design of the baskets. This curved look is great for branding and style. Our refurbished shopping carts now come in an assortment of grades. We carry Re-coated shopping carts that have been sand-blasted to bare metal and are then powder coated to factory spec and have all new wheels, handles, seats, seat belts and bumpers. Level 1 is the same thing except the carts are just cleaned and painted, not powder coated. Our level 2 carts are like level 1 except that the wheels are only replaced as needed and the good handles and seats are recycled onto these carts. We have crews that roam the city and return your carts to you. Call for more information. Click here to be redirected to our store featuring a wide selection of refurbushed and reconditioned shopping carts.. Call us to learn about our shopping cart service. Click here to learn more about our two tier metal and plastic shopping carts. Also known as convenience carts. © 2019 Carriage Trade Service Co., Inc. All rights reserved.